Because the movie gods love to punish the unsuspecting masses. Why else would we be on another Fast & Furious film, other than to try and salvage what's left of Vin Diesel's career? Do you want Ghostbusters 3? Well I might be more interested in Ghostbusters III than Men In Black III. Although nothing beats the original. So if the original cast reunites to make Ghostbusters 3, but feature only as advisors to a younger crew of 'Busters, it'll basically be the mid-90s cartoon series turned into a movie. Hoo. Ray. I want them to remake Star Wars with Scarlett Johannson as Princess Leia. Only please don't tape them down, please don't tape them down. Well, as little as I care to see the first two Ghostbusters potentially trashed as well, it still beats being subjected to a third Men in Black (MIIIB?). As far as I'm concerned, the Ghostbusters video game coming out this summer IS Ghostbusters III. So politely wait for Ghostbusters IV, please. Apparently another Fast & Furious was what audiences wanted..... $72 million opening. I know, will it still have it's legs next weekend? Isn't it time for Vin Diesel to make another Riddick movie? Believe it or not but there has been some discussion of another Riddick film. I saw Monsters Vs Aliens over the weekend in 3D, and all 4 trailers shown before the film where also in 3D. I had no idea so many 3D films were coming out! Well, if it has Danny Elfman, I may accept the film's existence. I just saw the trailer...I loved the book as a child, but I can't say I'm too excited for the film. Uh oh, Lucas in effect! Getting a director from BSG/The Wire was a good move, though. And Terrence Howard is always watchable. Wow, this film is finally getting made. It was almost in KOTCS territory, Lucas kept talking about it for years but nothing ever happened. Okay, I am going to be honest, I am really looking forward to this. This is the first non-franchise film by Lucas since...when, the mid-1980's? I know I am being too optimistic, but do you think John Williams will score it? No. Lucas is not directing the movie, and it is not a pre-established series like Star Wars. If Lucas produced something and left somebody else to direct (other than Empire and Jedi), the director selected the composer, such as Ron Howard using James Horner for Willow. Lalo Schifrin scored THX-1138, but American Graffiti completely used 1950s songs as the musical tapestry, rather than instrumental score. Other than that, Lucas hasn't really directed anything big. Theoretically, I don't see why not. I don't think it'll happen because of Lucas' involvement in cutting up JW's work, but I think the example of it being a different director has little to no bearing at all. The director could, y'know, want JW himself. That's true. Maybe Lucas could throw enough money at Williams, and offer encouraging bits like "but I'm not directing or editing this movie, I love your music, Johnny, so it'll be another editor and director who cut up your music and splice your pivotally emotional music around at the last minute for the final battle sequence" to entice him out of retirement. John Williams is probably the best composer left alive in the movie business, so if you want that old-style movie sound for this WWII epic, there is nobody better for the job. Lucas will never direct a movie again. And right now we should all be thankful for that. I'd be surprised if Williams scored it, he's never done anything Lucas besides SW and Indy. It'd be nice, though. Great. Now all I can see is Rocky in the ring with tats like that on his arms. Anyone seen the redband Brüno trailer yet? I never heard about this until now, thanks to Clint Mansell! Looks great, I'm a huge fan of Rockwell. Total Film magazine has just directed me to a trailer for a new sci-fi film starring Sam Rockwell called Moon. Has anyone heard of it? Apparently it is superb. This has just gone straight to the top of my must see list. EDIT: I see Koray beat me to it by 3mins. 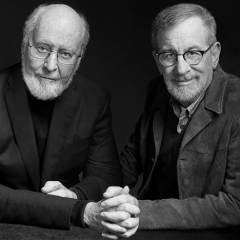 So, the odds favor that Williams scores the movie, but after the prequels, i dont think Williams would work with Lucas again. [Moon] has just gone straight to the top of my must see list. I haven't been excited about this project since it was announced, but at least they are casting good actors to fill the roles. Anyone noticed that David Koepp is the screenwriter for Angels and Demons? Will he pull a Jurassic Park or a Crystal Skull this time? Better than Akiva Goldsman's work for the first one, I would not be surprised to discover. I never knew production stopped. Thanks for the link. EDIT: Due to the kindergarten rules of this board, I've had to change the link url slightly in order to make it work. Scroll down a bit, sorry. Original and proper link here, just so you can see how stupid this place can be. Basically, the cute little rules of this board ruined the joke. FAIL. it turned the f bomb in the URL into "eff"
Why do we need the language filter, again? If ever there was a reason to bin it then this is it. I've changed the link (under force) so that you can find the story. Just scroll down a bit. Seriously, we're all big boys on here. The F word filter is a joke. In fact I find it offensive, and very little offends me. That was a hilarious article. "Ever since I failed to ruin Scarlett Johansson's career with The Island, I've been looking for a challenge like this," Bay said. "Who knows? With Transformers: Revenge of the Fallen and ThunderCats coming out in the same year, I may finally reach my goal of making all of America hate cinema forever." "The movie has been finished for quite a while, and it was always going to be released after Watchmen in March 2009. Then we screened it to the studios (DreamWorks and Paramount) and they started talking about holding it back for awards season. I so hate that term, but it's now set for a December release." He confirms with the delay in release, he has gone back and tweaked a few effects shots. I haven't read the book or anything, but for some reason I didn't think this was the kind of movie that had special effects? Considering it's about a girl who dies and watches the aftermath from heaven, yeah, you're gonna need some effects. Eh. I like a couple of his flicks (SIN CITY, DESPERADO, FROM DUSK TILL DAWN), but I've never seen one of his movies I thought was actually genuinely good. Weird choice. I guess reboots are going to be all the rage for the forseeable future. Grr. I had a whole long post written and then Firefox died on me. I just think it's a weird choice. PREDATOR is a very well-made film, with an iconic creature and a sequel that's better than a lot. The problem isn't the franchise, it's that it's either been given over to pooty directors (Paul Anderson, The Strausse Bros) who have just essentially remade the films, or turned them into mini-kaijus. Fox has been squeezing blood out of the Alien franchise since RESURRECTION, and all the films since then (that one included) have been terrible, although I'm wondering if Fox would have the balls to reboot Alien.